Modern Designs for Classic Quilts Giveaway! When I was working on Stitch Savvy, there were a few hairy moments. The book has 25 projects, and I had one week to shoot ALL the step-by-step photos for the lessons. At one point, we simply had to call in reinforcements to prep some of the pieces behind the scenes before bringing them into the photos–and Kelly Biscopink saved the day. She’s skilled and smart and has a keen eye for detail, and she was willing to come in and stitch a zillion little squares together in the background so that we could get the work done in time. Naturally, when I heard that Kelly had written a book of her own, I was beyond thrilled–nothing in the world makes me quite as happy as knowing that someone I like and admire has something good coming their way! 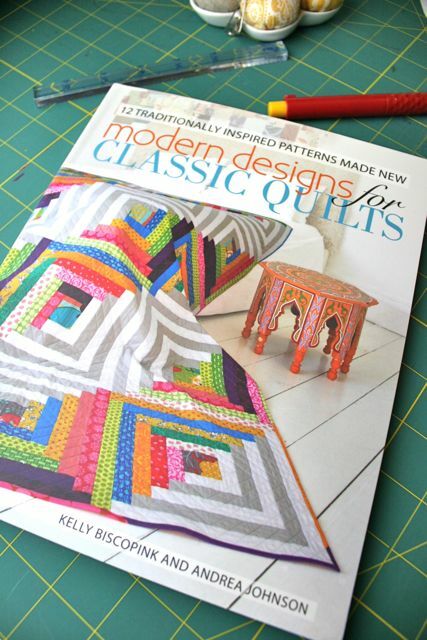 Kelly’s book is Modern Designs for Classic Quilts, and it is just delightful. Written with Andie Johnson, whom I had the great pleasure of meeting at Quilt Market this year, and who is every inch as talented and lovely as Kelly, the book is pretty and colorful and creative and full of great tips and great designs for a dozen quilts that are based on classic designs but lead you as the quilter in a modern direction. These ladies are so smart and so warm and so invested in what they do that it comes across in every word on every page, and it leads to a book that’s a real pleasure. The patterns include some of the most classic of all quilts: postage stamp, coin, flying geese, log cabin, spider web, and Dresden plate. The photos are just lovely, the fabric selection is inspiring, and the writing is so very accessible. I love the way both Kelly and Andie make it clear how to create each quilt and give the reader the confidence to dive in and be bold. My kind of book! There is a thorough techniques section, making this a good book for beginners, but the templates and designs that are included mean that even an intermediate-level quilter will find plenty in this book to love! Not only are Kelly and Andie generous with their time and talents, but they have very graciously sent along a copy of the book for me to giveaway to you! These ladies have written something really lovely, a book that you’ll be able to reference over and over, with plenty of eye candy to get you to look at your stash in a new way and make some quilts that you and your family can snuggle under and treasure. One entry per person, international entries welcome. Giveaway closes Monday, November 19 at noon. Winner will be announce the same day! Follow the rest of the Modern Designs for Classic Quilts blog tour for more inside peeks and chances to win! ← Live Quilting Event This Weekend! Want it! Want it! You know as soon as my move is over, I will make every quilt in this book!!!! Oooooooooooohhh. I shall cross my fingers that I win, b/c this looks awesome! This looks like such a cool book, I’d love to have that one in my collection! I just bought my very first quilting book about 2 weeks ago and now I’m hungry for more — I’d love to win this! Thank you for the informative review. Just the cover quilt makes me want a copy as have always wanted to make a log cabin quilt and this one is beautiful. Thank you for the informative review. Just the cover quilt makes me want a copy as have always wanted to make a log cabin quilt and this one is beautiful. Thanks for the chance. HI! REALLY LOOKS LIKE A USEFUL BOOK! What a fantastic book. Thanks for the chance to win. Ooh, lookslovely. Just starting to plan my first ever quilt! This book looks great! I would love to win! 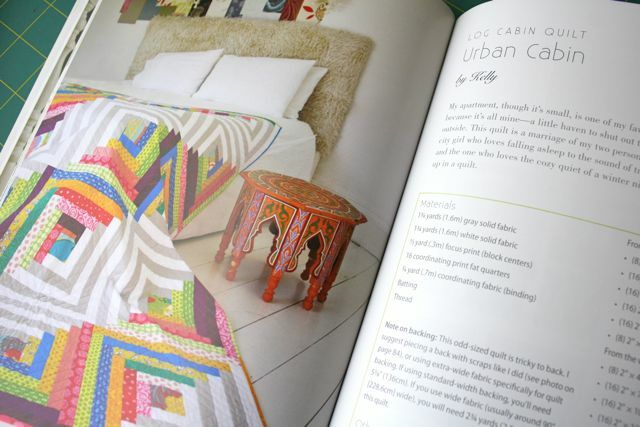 Love the look of the quilts in this book. Also love connecting with new blogs through the hop. This looks like such a great book! Thanks for the chance to win. Beautiful quilts. Just the right balance of modern and traditional. I’d love a copy for inspiration. Thanks! I really want to make a quilt like that one on the cover!!! This book looks fantastic! I really like that last quilt photo too! I’ve made a few quilts but have been so inspired by what I’ve seen lately. I’d love this book. Thanks for the sneak peek inside this book – it looks wonderful! Wow I always live to learn new techniques! Thanks for the chance! The more I read about this book, the more interested in it I become. Thanks for the chance! This looks like a great book. If I don’t win, it’s going on my Christmas list. Lovely photos! Thanks for the chance to win! Andie said lots of good things about you, I believe she is right! You are so talented and pretty and sweet! I have checks in the mail to both of you for saying that. Keep an eye out. I’m seeing lots of quilts from this book that excite me. That diamond one is super. I love all I’ve seen so far during this blog tour about this book. The pictures of all these quilts in the book look fabulous. Would love to be in to win, need more quilt books! Throughout the blog hop, we’ve been shown quite a few of the quilts in the book, and I can honestly say that I haven’t seen a single one that I wouldn’t want to make. That’s exceptional! Thanks for the great giveaway opportunity. This looks like a very good book. Looks a fabulous book! I have enjoyed seeing inside it – I especially love the flying geese quilt! 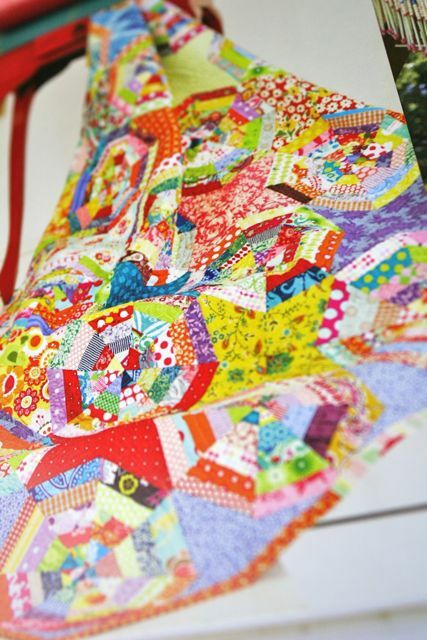 I adore the log cabin quilt on the cover of that quilt…gorgeous. Thanks for a great giveaway. Wow looks like a great book! I see lots of great quilts in this book, it would be hard to decide which one to try first! I’m leaning toward the diamonds. I have definitely seen some quilts that I want to make in this book. Thank you for the chance to win. Modern designs of classic quilts are my most favorite kind of quilts! So…this book is most definitely a NEED for me. Forget want. It’s a need. I am crossing my fingers for this giveaway, but if some other lucky duck gets it, I’m putting this at the top of my Christmas list! Hi!!! I would love to have this book!!!! Thanks for the fun!!!! Looks like a must have book! The photos and diagrams make this a ‘must have’ book! Thanks for the chance! This book looks great! I have added it to my wish list just in case I don’t win. Thank you for the giveaway! Love that quilt on the front cover!!! I’d love to win this book. I know the authors must be thrilled to see their work in print!! This looks like a great book! I would love to own it…will add to my wish list if I don’t win this great contest. Ooh – what a great giveaway! I’ve just finished my first quilt for my little girl and would love this for inspiration for my next one… I’m officially addicted! I love that gray framed diamond quilt! What a great quilt book! I love the twist! Hope to win and my first quilt will be an Urban Quilt like the one on the cover. So pretty! My niece is a brand-new quilter. I’d be thrilled to win a copy to share with her. Thanks for highlighting this great new book. The book looks wonderful – thanks for sharing. Looks like a fantastic book – thanks for the chance to win! That is a beautiful quilt – thanks for the giveaway, I’d love to win this! This looks like a wonderful book! Thank you for the chance to win one!!! 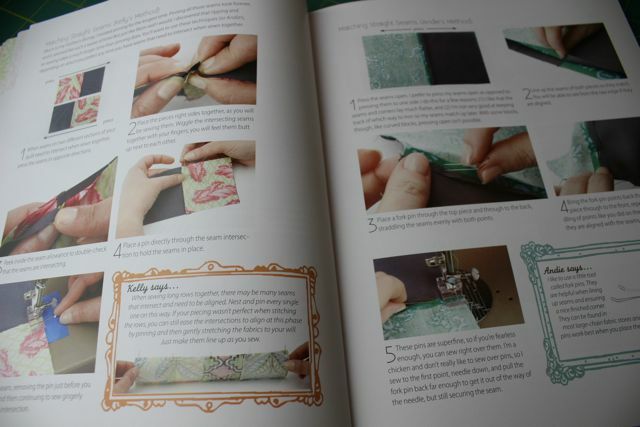 Oh, the more I see of this book, the more I would like to try the patterns, and not just one! Thanks for the chance! Get outta town! I’ve been planning on making an “American” (i.e, red, white and blue) log cabin quilt for my parents, so I love the cover photo. Thanks for the inspiration! that book looks great and probably hard to find here in Belgium so i hope i have a change to win that book. Wow, great quilts, especially the diamond one! This book looks fabulous! I’d love a copy so I can spark my creativity. The traditional patterns are beautiful and fun to make, but with such a modern twist these quilts will be a fresh way to use my stash. Thanks for sharing it. I don’t normally enter giveaways; I mean, really, what chance do I have? BUT ~ I think I need to make that diamond quilt. please, pick me? Just in time for my Christmas wish list. What inspiring ideas! definitely eye candy! 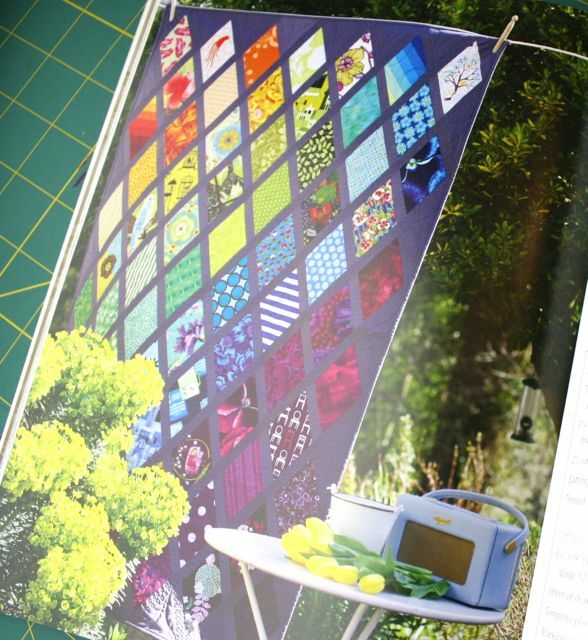 love the fresh patterns in this book … the diamond quilt is a dream quilt! would love to work it up! thanx for the chance to win a copy of this delightful book. My kind of book, looks smart & fabulous! What beautiful quilts, so much color! Looks like an awesome book! Thank you, Kelly and Andie for a great giveaway and a chance to win. holy crap, those quilts are so great!!!! i would love to make that log cabin quilt! I love the colours and fabrics! I have never quilted before but have been thinking about it and this makes me think even more. Have also just discovered sewing and DIY blogs (about 5 years late!). How awesome is it that there is so much inspirational stuff? Who wouldn’t love to try out some these bright, inspiring designs? Me for sure. This looks like my kind of book–traditional designs with a modern twist. Looks like a great book. Thanks for the chance to win one! I’m newish to quilting and am very excited by this quilt. I love the photos I’ve been seeing! I am a retired Home Economics teacher and this book would be a real motivator for me as I am looking for “new” blocks to create a quilt for a former colleague, an art teacher who has expressed a desire to learn to sew. This book looks amazing! Love the log cabin, love the spiderweb, love it all. This book looks fantastic! Thanks for the chance! I’m really intrigued by the Urban Log Cabin, my fingers are itching. Next project is scheduled, as soon as Helix pair quilts and pillow cases are finished, I’m on for Log Cabins. If I don’t win this book, I’ll just oder it! Thanks for offering this giveaway and good luck to all who participate! I’d love to have a copy of this book. I like when the old favorites are made modern! I think this book will be great inspiration. That spider web quilt is the most beautiful I’ve seen!